As many of you know, my family and I absolutely love Honey Bunches of Oats. And this past month, we were sent a box for FREE to try thanks to Purex Insiders. I just love the Mango-Coconut flavors...it makes you feel like you are on a tropical island retreat. With 50 million smiles and counting Honey Bunches of Oats is introducing a new way to smile...Crispy mango flavored flakes combined with real coconut shavings and coconut flavored granola clusters in New Honey Bunches of Oats Tropical Blends. 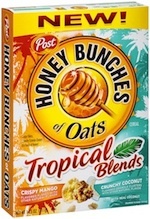 Honey Bunches of Oats Tropical Blends is packed with 10g of Whole Grain. And what's nice about this cereal, is that its only 120 calories. And 6g of sugar compared to Honey Nut Cheerios at 9g. Includes 9 essential vitamins and minerals including 60% daily value of iron. 4 wholesome grains also Heart Healthy 0 grams of Trans Fat, 0.5 Saturated Fat, and 0mg Cholesterol! Want to escape to the tropics? 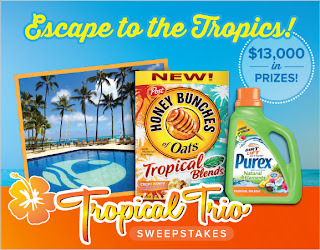 Enter to WIN $13,000 in prizes from Purex!! If you would like to learn more about about Honey Bunches of Oats you can check out their Facebook page, where they offer coupons and more information on all their products! 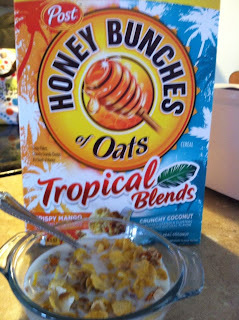 I received a free sample of Honey Bunches of Oats Tropical Blends for this post from Purex Insiders. My participation is voluntary and my opinions, as always, are my own.